Congratulations to Ibelisse who won the copy of Carols Kent’s new book Unquenchable! You still have time to enter the giveaway for Susie Finkbeiner’s new novel My Mother’s Chamomile. Enter on this post! A walk through our local botanical gardens was just what my winter-weary soul needed a couple weekends ago. As we traipsed the greenhouse displays, my lizard-like skin soaked in the humidity. I was tempted to just sit on a warm rock for awhile. A display of bromeliads caught my attention. I pulled out my phone and snapped a picture. When we lived in Florida, bromeliads ringed two large oak trees in our backyard. Every spring, sunshine-orange flowers shot out the center of the splayed green leaves. Every morning, I’d peek out the window to count how many more had arrived over night. They were my favorite tropical flowers, and I took for granted they were in my backyard. The spikes of color, surrounded by a decomposing wooden fence and always-brown grass, were the only pretty things in our yard. Having lived in a number of towns across a few states, I’ve come to realize how often we take our hometown for granted. It’s just “home.” We see the things that surround us every day, without really “seeing” them. They’re ordinary. Part of our routines. Boring. Everywhere else seems more exotic (especially if you live in the north right now). It’s often not until you’ve left that you appreciate the beauty that surrounded you. So, this week, let’s appreciate the beauty that’s in our backyards. Let’s open our eyes, snap some pictures, and really see the things that surround us. I’ve come up with a short list of ideas to awaken us from our ordinary slumber and appreciate our natural habitats. I’d love to hear what you would add to this list! 1. Take a walking tour of your neighborhood or town. Look for signs of wildlife or any new vegetation sprouting. 2. Visit a local park and walk the trails. Take a bird guide and make a list of the birds you identify. 3. Visit a place in town you’ve heard about but never been to such as a museum, botanical gardens, flea market, or farmers market. 4. Look up your state “stuff” – your state bird, rock, tree, etc. and then see if you can go find them. 5. Look up your nearest national park/memorial/forest. Plan a trip for spring or summer. 6. Make a photo scavenger hunt (find a rainbow of colors, find various objects, give clues to famous spots around town) and head out as a family to complete it. 6. Visit your local historical sites. Read the stories surrounding the event/person/place. 7. Make a list of local places that play significant parts in your personal history. Do a tour of the “old spots,” re-tell the stories, and make new memories. This list on how to be in a tourist in your local town has great ideas too. 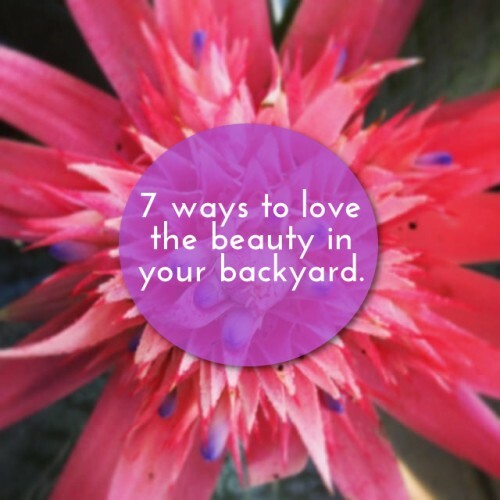 How do you take advantage of the beauty in your backyard? Share with us! We’d love to see your Backyard Beauty. You can post your picture on Twitter and tag me @amrhodes, or post it on Instagram and tag me @ameliamrhodes, or post and tag me on Facebook. Yes! The other day, Little Miss and I had lunch out together and we watched a squirrel eat berries on a bush right outside the window the whole time. I probably would’ve missed it! A great reminder, we love Lake Michigan and hiking. It never gets old 🙂 This winter though… oh man, its a rough one. I hear you. Oh mercy. This winter!! I was just thinking about loving my hometown today.